Mwahahaha. My money's on Mr. Snicket. Thank you for your further mockery of Pitiful Pittacus and all his ilk. 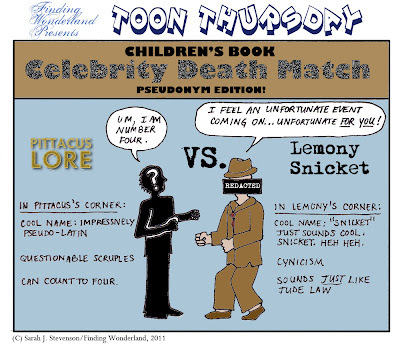 My money is on Lemony Snicket as well. Mwahahaha! How did we live without Toon Thursday? Thanks, Heather, for stopping by! Yep, we have many more toons in the archives. I'd gone on hiatus for a little while, but now the toons are back, twice a month.